Took another class at Blue Moon Glass, for glass fusing and slumping. The first week we learned how Bullseye glass, heated in a kiln, reacts to objects in its way. We used a fire resistant batting (don't remember what it's called) and cut out designs with it, and then placed our two layers of glass (one clear, one colored) on top of it on a kiln shelf and ended up with (for lack of a better description) thick glass trivets with designs embossed into them. Mine is a sun face. Considering I had to come up with a design quickly (something out of my head in like 15 minutes with no reference), I'm fairly happy with it. Notice there are a lot of air bubbles in it which we learned is caused by the air pockets sandwiched between the two layers of glass as the glass had a rough finish on one side, so air was trapped during the firing process. You can see from the picture, but there are different levels in the sun's flames, some are a single depth and others are stacked created a double depth emboss. I wish I'd put creases in the batting to make a line between the upper and lower lips but I didn't know this would work until the 2nd glass, because a few other students just tried it and it worked. it rounded like a shallow bowl, or sushi plate. I didn't do any design on mine, just one layer of brown glass (bottom) and one layer of iridescent crackled glass (top), which turned out really nice with the brown highlighting the ambers in the iridescent spectrum. Another student did the same thing but with blue glass on the bottom and her iridescent glass has a much more rainbow spectrum appearance where mine is mostly ambers and purples. Next we did a round dish that we slumped into a mold that made it rounded like a shallow bowl (pretty much the same as last week except we cut out circles instead of squares, circles being more difficult). I decided to do a design this time, something a bit more challenging. I cut squares of glass using the Morton Glass Cutting System, and then hand cut the edge pieces to fit the outline of the base circle (a bottom layer of pumpkin orange glass). 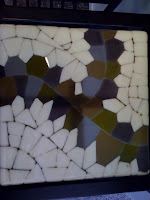 You glue the pieces on the base with small amounts of glue before firing. I used some color shifting glasses, so the design looks considerably different then before it was fired, but I think it turned out really nice. Then we did a donut slump where we put our glass on a donut shaped mold so that the glass melts into the middle hole, creating a vase-like piece. I tried to do something a little different, using a criss-cross or grate pattern of glass slats but it was fired with other pieces that required a longer kiln time so my piece was destroyed in the experiment, which I figured was highly possible. I'm hoping to use parts of this failed piece in future pieces. 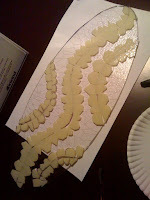 Last we were allowed a free-form piece using any of the slumping molds Jim had on hand. So I chose a 22-inch mold shaped like a surf board and this really cool display piece that Jim did as inspiration. and organic looking piece remeniscent of bone...I may have to end up getting it sand blasted to get the effect I'm looking for, but I won't know that until after I finally get it fired. I also started the rough cutout for another piece I want to make that will have rimmed board of metallic triangles, but I promised myself I wouldn't finish that one, until the surf-board one is done; otherwise, the more tedious one will never get done! At least I know myself well enough to prevent that from happening....I hope.